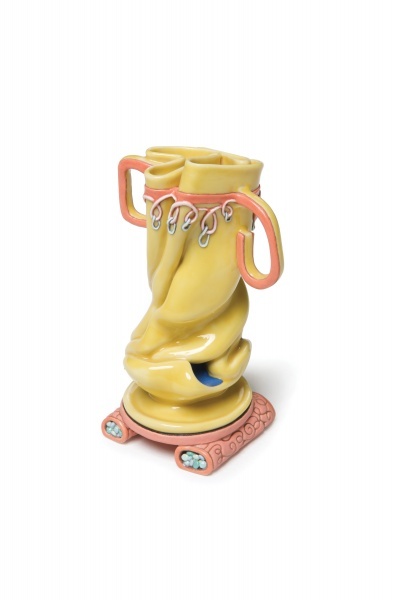 American ceramist Kathy Butterly earned a BFA at Moore College of Art in 1986 and an MFA at the University of California, Davis in 1990. Her awards include the Evelyn Shapiro Foundation Grant in 1993, an Empire State Crafts Alliance Grant in 1995, an NYFA Grant in 1999 and the Anonymous Was a Woman Award in 2002. Butterly will be speaking alongside her fellow Dirt On Delight artists Ann Agee, and Beverly Semmes on the panel There’s Just Something About Clay, with coordinating exhibition curator Andria Hickey. The discussion will take place at 7:00 pm on Thursday, October 8th, 2009, in the Walker Art Center Cinema. Tickets are free and will be available at the Bazinet Garden Lobby desk from 6:00 pm. In your answer to the Institute for Contemporary Art question,“How did you come to clay?” you cite Viola Frey as an inspiration. You said the way she worked was so confident, almost macho, that you were so inspired to make clay your medium. Now, you’re being exhibited with her in the Dirt on Delight show. Can you comment a little further on her inspiration and the rest of your process in working with clay? I think that basically in addition to what was already mentioned, Viola was there at the right time/right place for me. She enabled that light bulb to go off over my head. In addition to Viola, Jack Thompson and Ken Vavrek who were my ceramic teachers at Moore College of Art, helped to open my world up further with inspiration for world travel and also taught me the down and dirty basics of working with clay. You wouldn’t realize by looking at my and Viola’s pieces that she was an original source for my love of clay, but after witnessing her in action, making her monumental pieces, I began to also work very large….4-9 ft. tall. Now my works are 4-9 inches tall. Why is there a distinction between ceramics/clay and any other sculpture? How important is that distinction anymore? 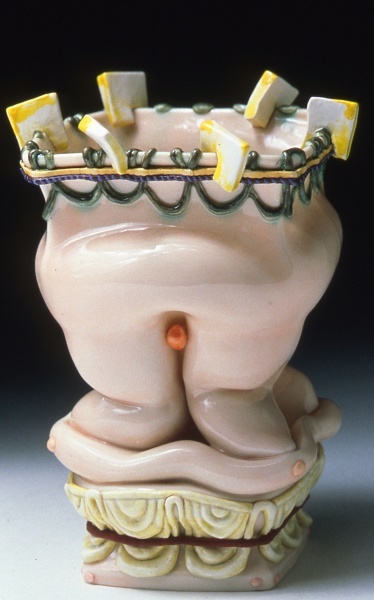 “Kathy Butterly’s tiny ceramic vessels are abstract and intensely associative, most often evoking aspects of the body. They recall the convolutions of George Ohr’s pots and Robert Arneson’s mugging faces and twisted figures, as well as the finesse of Adrian Saxe’s gew-gaw-ornamented vases. Her playful tone echoes these predecessors, but with a coyness that seems distinctly feminine.” That’s a quote from a review of your work by Janet Koplos in the New York Times. Can you talk about how you come to create some of these objects? Particularly, Fall into Spring, Cenotes, and Like Butter, which I believe are all in Dirt on Delight. I never know what a piece will be/look like until it is completely finished. I never do sketches…..I can explain my process- both thought and making- like that of a Rorschach test combined with exquisite corpse. I start with a form, react to it, add to it, fire it, react, fire react……..so on. At a certain point I understand where the piece wants to go and after it is complete I understand the meaning of the piece….. ” Fall into Spring” has to do with how I was feeling after 9/11 (I live downtown in Manhattan.) My head was so full of information and it felt so heavy…..I made a few pieces like this one. It is definitely a self portrait ….of how I was feeling….. If you look at the piece “Like Butter” – it is a piece made early in my relationship with my husband. Cenote has to do with lushness, about showing off the inside as an equal to the outside and also about the fear of loss of water…..
What would you say to artists choosing clay as their medium to create? I would say the same thing to anyone who wanted to be any sort of artist….just be honest to yourself and your work.